I’m unabashedly excited about our lunch at L’Ermitage. First, I’m hoping for a French-influenced menu. Second, I know this will be a balm against all the other crowded buffets to come. We catch a shuttle car fully 45 minutes before our noon appointment and it’s a good thing. Friday lunch traffic is creakingly slow. It takes us all of the 45 minutes to go 11 miles! L’Ermitage is a posh hotel in Beverly Hills. Chandeliers hang from the ceilings. Andy Warhol exhibits abound. Vibrant floral set pieces astound. We are ushered into the marbled lobby and pointed past the bar to the dining area. A hostess asks our names, then bids us wait out on the patio where a jazz trio plays soft music. Branded champagne, bottled for L’Ermitage by Louis Roederer, flows freely. We meet up with some local food bloggers and proceed to mingle. Soon, hors d'oeuvres make their way out of the kitchen. There is a light and airy cheese puff which all but disappears under the onslaught of sparkling wine. A lamb meatball on couscous is nice, if a little underspiced. Lime-cured hamachi is a fresh ribbon of puckery goodness. But the braised octopus, with a bit of lemon, steals the show. Because I know we have a full four course meal ahead of us, I take only one toothpicked tentacle, but others in our party (who shall remain nameless) may have had up to four of these delicious bites. Who can blame them? Finally, we are invited inside for lunch. I’m already three glasses down on champagne, so I have to gird my loins for the four paired wines (with some refills, I might add). Our first course is Marinated Yellowfin Tuna from Chef Richard Reddington. It’s a monstrous, thin slab of fish beautifully decorated with beets, wafers of radish, cilantro, and a drizzle of basil oil. Again, the fish is so fresh there is no odor or aftertaste. It almost eats like a piece of raw beef. None of my anti-fish gag reflexes are engaged, so I clean my plate. Delicious! The Kunin Sauvignon Blanc washes it down splendidly, though I’m glad we’re moving on to red right away. Next Reddington delivers a Crispy Chicken Thigh. The chicken is a boneless hunk of dark meat with a slightly crisped skin re-adhered to the top. 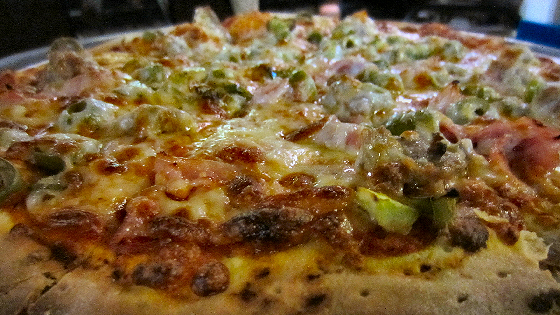 Mixed with the beans, pepper, tomato, and almonds, it’s a hearty bite but without much else to recommend it. I’m not digging too much on the flabby chicken. However, the Wind Gap Pinot Noir is superb, full of mineral notes and tannins that contradict the style. Arroz de Pato from Chef George Mendes comes out next. It’s essentially duck confit with chorizo and black olives on rice. There’s a playful spiciness to it and some fun to be had between contrasting textures (near-raw duck, crunchy skin, and crispy confit). My plate only has one or two discs of sliced chorizo, though, and other folks have a tough time finding theirs. It’s good, but not as stellar as I hoped. My glass of Leviathan blend is definitely the highlight. It is velvety but bold. The sommelier refills my empty glass with a knowing smile. Lastly, dessert is served. Chef Benjamin Dayag, the resident chef at L’Ermitage, offers up a honey-citrus cake, sided with creme fraiche ice cream, a touch of basil, and coconut jam. I like the charred banana slices on top, but don’t taste any coconut. The cake is fine, moist enough and spiced evenly, but merely serves as a vehicle for the other components. It caps off the meal adequately. Everyone agrees the 10 year Ramos Pinto tawny port is exquisite. It could have been dessert by itself. As we thank our chefs before they rush off to their next assignment, I can’t help but feel slightly underwhelmed. Everything at L’Ermitage screams culture and class and perfection. Yet, the best bite I had was a simply braised chunk of octopus out in the courtyard. None can argue about the wine selection. Give me about half a dozen more tentacles and a bottle of that Leviathan, and I’ll be a happy camper. The traffic in Los Angeles always amazes me and I’m glad we planned for 45 minutes for the 11 mile drive! But lunch with a group of food bloggers at L’Ermitage beckons and we make it just as the festivities begin. For about 30 minutes, the champagne flows and trays of impeccably prepared bites parade past us. Lamb meatballs with couscous, charred octopus with black olive tapenade, hamachi slices sandwiched with a citrus jalapeno filling, and Parmesan gougeres are served with L’Ermitage branded bubbles by Louis Roederer. 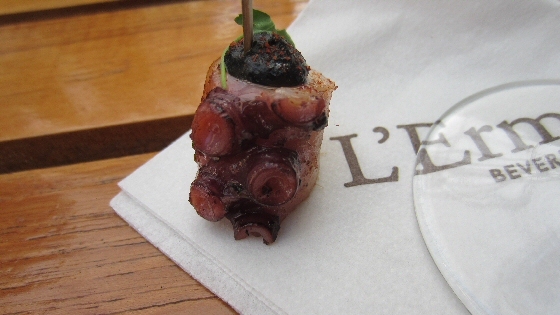 All the small bites are heavenly, though the charred octopus is my favorite and I devour more than my fair share. No ordinary Friday lunch indeed! Our first course is Marinated Yellowfin Tuna, essentially carpaccio of thinly sliced fish dressed with red and orange beets, radish slices, baby cilantro shoots, and basil oil. It’s impressive because the tuna slice is so incredibly thin and uniform and yet so large at the same time. Impressive knife skills here! The radishes are also sliced super thin (my inner voice says “wafer thin” like the Monty Python skit). So thin they’re actually translucent. It’s just an incredibly beautiful dish with the pink fish, bright beets, and verdant-hued oil. The sheer amount of raw fish on my plate gives me pause...until I take the first bite. It’s clean and slightly briny, sweetened a bit by the beets, peppered with the sharpness of the radish, and contrasted with the crunch of the cilantro shoots. Usually I’m a “take it or leave it” gal with raw fish, but next thing I know I’ve devoured my entire plate. The grassiness of the 2012 Kunin Sauvignon Blanc works wonderfully with the dish. Next up is a Crispy Chicken Thigh with shelling beans, peppers, and tomato. It’s a cute little boneless thigh perched on top of the plumpest beans I’ve ever seen. Before today, I’d never heard of “shelling beans” and find them to be tasty and comforting. Somewhere between the spring-like fresh seeds inside a green bean and the soft, almost mealy texture of baked beans. I’ll have to keep my eyes open at the farmer’s market for shelling beans because I adore these. The chicken is cooked perfectly, still moist but with a snappity crispy skin. The tomato and peppers give the dish a zesty bite. There’s a smattering of sliced green bean pods mixed in, which gives the dish a great jolt of green and a bit of crunch (besides that skin of course!). I’m not usually a fan of Pinot Noir, but the 2011 Wind Gap Pinot is peppery, earthy, and full-bodied. Our third and final savory course is Arroz de Pato, a Portuguese dish that translates to “baked rice with shredded duck”. A very rare slice of duck breast sits atop shreds of duck confit with a lovely mound of rice, chorizo crumbles, and olives. I hear a few grumbles about the lack of chorizo from fellow diners, but I’m in heaven with olives, rice, and confit duck. The 2010 Leviathan California Red pairing is divine, as is the hefty refill the sommelier provides our table. I love a big bold red that slaps me when I sip it and Leviathan does not disappoint. I am relieved to discover dessert is not chocolate, but rather a Honey Citrus Cake with charred bananas, creme fraiche, coconut jam, and vanilla ice cream. It’s paired with a spectacular 10 year Tawny from Ramos Pinto. We drink port at home, mostly during cold weather months and usually in place of an actual dessert. Sipping it with the cake, only slightly sweet from the honey and the luscious ice cream, is an pure indulgence. It’s interesting to note that most of the ladies at the table are reluctant to try the port, but after a sip or two become converts. Our luncheon has been a fabulous weekday treat, but it’s time to get back to work and prepare for tonight’s functions. Luckily we have a shuttle to take us back to our hotel; no driving after all the wine pours. P.S. Never trust a man who counts the toothpicks on your plate after the appetizer portion of the meal!